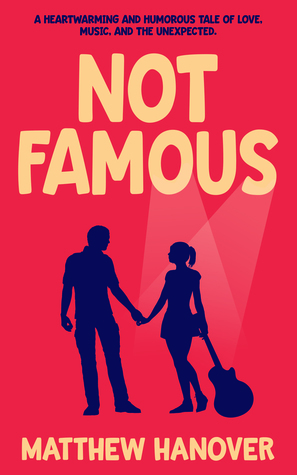 Not Famous by Matthew Hanover is a delightful, charming and humorous story that romance readers will thoroughly enjoy and be unable to put down. In this wonderful debut novel, we are introduced to Nick Forrester who has just proposed to his girlfriend, expecting a yes answer, and to have a happy marriage with her. However, it doesn’t go as he desired and he is left embarrassed and all alone. Then, fate steps in when he meets a young cute woman at his favorite coffee shop. Alli, is a barista and musician, a solo act. Nick attends one of Alli’s shows, loves her music and asks her out to dinner. Alli is a super lovable person with no dating experience. She is a very private person with a past to hide and a guarded heart. Nick has more experience when it comes to being in a romantic relationship, but he has been hurt, somewhat damaged and humiliated. Since he is more experienced, he tries to help Alli through the dynamics of being in a relationship. But, he often puts his foot in his mouth and struggles while trying to make their relationship work. He is protective of her while dealing with some of his own baggage. They both need to learn to love and trust again. They are very different from one another, and readers will be enthusiastically rooting for them in this entertaining love story. Set in Boston, Not Famous will really appeal to those who love music and romance. I was fully drawn in by Nick and Alli’s story and had a very difficult time putting this book down. The relationship between this couple has many awkward, yet endearing, moments and makes for a very relatable and enjoyable story. Alli seems socially awkward but she is strong in many ways. She is a great unforgettable character. Nick is a character that becomes more and more realistic as he deals with his past, and readers will inevitably come to love him. There are some fabulous supporting characters and their storylines add a lot of flavor and interest to this book. Matthew Hanover has created well developed characters that will tug at the heartstrings. He is an extraordinary first time author and one would never guess that this is his debut. I enjoyed Not Famous and was fully engaged from the very beginning to the wonderful conclusion. It is very different and is written extremely well with a unique voice and storyline. Matthew Hanover has a clever way with words and way of describing the setting, people and music scene well. This story is compelling, captivating, intriguing and fun. I highly recommend it to all readers that crave exceptional love stories, memorable characters, and an exciting and romantic plot. Get yourself a copy and be transported to a world filled with romance, warmth, humor and emotion.